We are delighted to be working with over 40 hotels across the island of Ireland along with the Leopold Hotel in Sheffield, England. From student accommodation to luxury country retreats, we can deliver business to fill those challenging dates. Our hotels are sorted by county. Lists are in order A - Z below. Aspect Hotel Dublin Park West is an excellent 3 star hotel, just approx 20 mins drive to city centre & within easy access of all major routes from the city. Facilities include: 146 bedrooms, restaurant, bar, meeting rooms, coach parking. 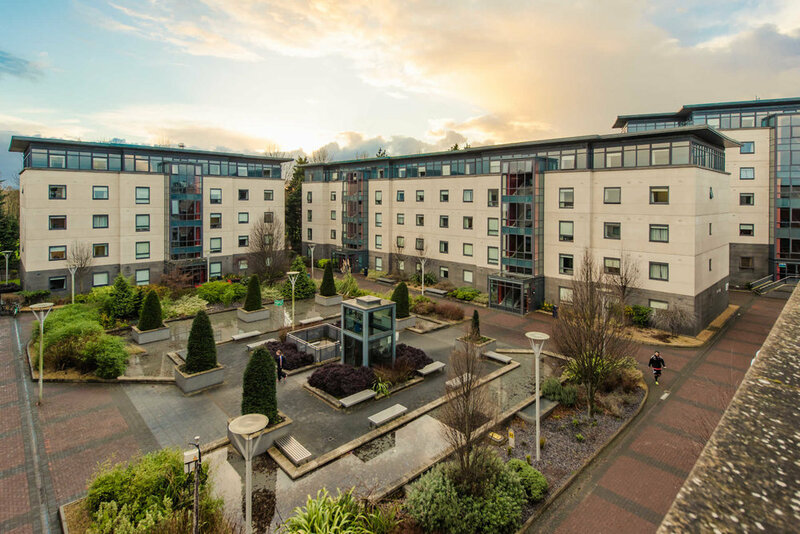 Dublin City University Accommodation is a modern property to a 3 star standard and is ideal for groups due to its close proximity to Dublin Airport and approx 15 mins drive to Dublin City Centre. Facilities on site: restaurant, bar, leisure centre, coach parking. The IMI Residence offers 50 executive hotel bedrooms, just approx 20 mins drive to Dublin’s city centre. It is close to Dundrum town centre & Dublin’s tram system (Luas). This provides easy access to Dublin City Centre. This excellent 3 star hotel is ideally located just approx 25 mins drive to Dublin City Centre. It is also close to Dun Laoghaire & other scenic villages of Dalkey and Killiney. Major road networks such as the M50 and N11 are short distance away with direct access to Dublin City Centre and Airport. Facilities include: 90 bedrooms, restaurant, bar, leisure centre, coach parking. Roganstown Hotel and Country Club is scenically located on the outskirts of Swords and close to Dublin Airport. Just approx 20 mins drive to city centre Dublin this stunning 4 star country house hotel has a fully equipped leisure centre, an indoor swimming pool, spa and golf course. Other facilities: restaurant, bar, coach parking. The 4 star Plaza Hotel is a modern hotel in South County Dublin overlooking the spectacular views of the Dublin & Wicklow mountains. It is an ideal location to stay whether its for business or pleasure purposes. The Parkview Hotel, is located south of Dublin nestled between the Wicklow Mountains and the Irish Sea. An approximate 35 minute drive takes you to Dublin City Centre. Located right in the village: guests can stroll to local shops, bars & restaurants. Facilities include restaurant, bar & coach parking. Tulfarris Hotel & Golf Resort, Blessington is 4 star a luxury 4 star resort with a championship golf course set on picturesque grounds. It is located approx 40 mins drive to Dublin & close to Avoca, Kildare outlet village/Newbridge Design Centre/ Russborough House/Japanese Gardens/National Stud & Powerscourt. Facilities include: restaurant/ bar/ beauty rooms/ golf course. A modern, classic hotel incorporating comfort and class with a traditional Irish country pub where you will meet the West Kerry locals and absorb Irish hospitality at its finest. Just 15 minutes drive from Dingle town and bay and 5 minutes from beautiful sandy beaches. Located in the town of Cahersiveen, just one hours drive from Killarney, this hotel has 53 modern bedrooms & 24 holiday apartments. The hotel offers great food & drinks served in the hotel's restaurant & bar. Cahersiveen is a town in County Kerry on South West coast of Ireland. Situated on "The Ring of Kerry" and "The Wild Atlantic Way". The Derrynane Hotel is situated on the beautiful & much famed Ring of Kerry on the Iveragh Peninsula in South Kerry. The property has 65 bedrooms & 8 holiday homes and offers delicious food & drinks served in it’s restaurant & bar. They are located approximately 20 minutes drive to Sneem & 25 minutes drive to Kenmare respectively and are surrounded by iconic sites including the ancestral home of Daniel O’Connell, Inch Beach and Skellig Islands. The award winning Claregalway Hotel is a modern hotel located in Claregalway village outside of Galway City. This hotel is ideal accommodation while travelling around the West of Ireland with its spacious and contemporary rooms and award winning Bar & Restaurant. Just approximately 10 minutes drive to Galway city. Coach parking on site. This family run hotel has a great reputation of being your 'home away from home' when visiting Galway. In a great location and with unique classical decor, this is a fantastic destination for break to the West of Ireland. 10 mins drive approx to Galway city. Facilties: leisure centre, restaurant, bar, coach parking. 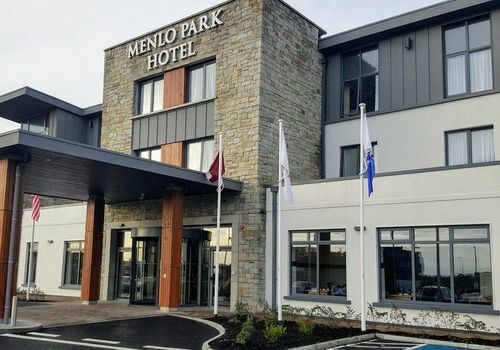 Menlo Park Hotel is an award winning 4 star hotel in Galway City. 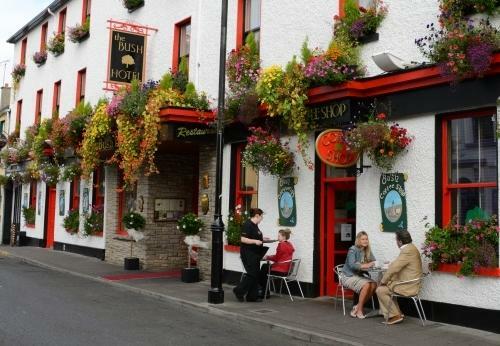 Bia Beo restaurant and Bar Beoga are both excellent places for quality dining and to enjoy a drink within the hotel. 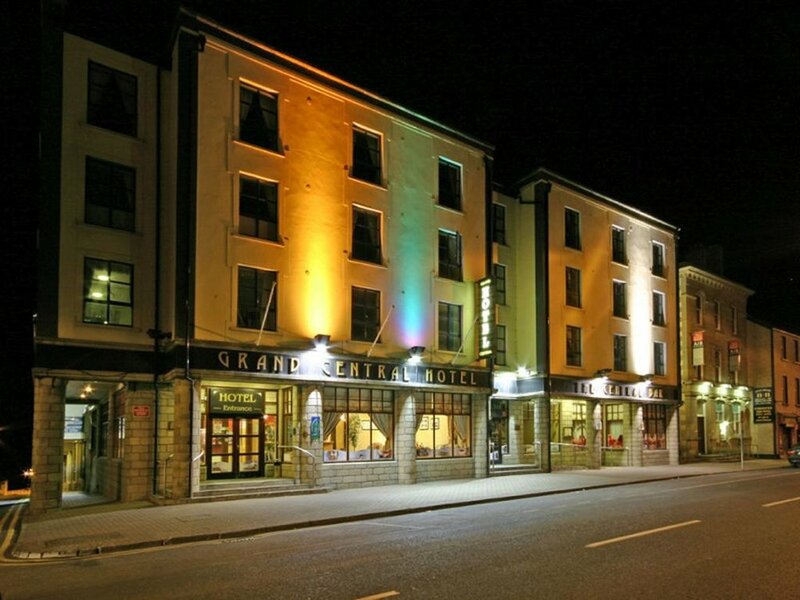 This luxury hotel has 81 elegant guestrooms and is in a prime location in Galway City. The Cahir House Hotel is a 3 star hotel that was once a manor house but now provides quality service and accommodation in the centre of Cahir town. It is a great location as a base or as a stopover on route to Dublin from Cork. Facilities: restaurant, bar, coach parking. Racket Hall Country House is located in the quaint heritage town of Roscrea. This charming location is perfect for those as a base stay to explore all the local attractions or as a stopover to Dublin, Limerick or Galway. Facilities include: restaurant, bar, coach parking. This traditional Irish hotel is located in the vibrant town of Letterkenny. Dillons Hotel pride themselves on their friendly atmosphere and are home to their popular Dillions Bar & Grill. It is a great location to explore Donegal & the North west of Ireland. Close to Donegal town & Derry. Facilities include: restaurant, bar, coach parking. The Grand Central Hotel is situated on Bundorans’ Main Street. In addition to their own Wild Atlantic Bar & Restaurant, they are in the heart of it all with a fantastic selection of great places to dine and visit local shops & bars. The famous blue flag beaches are moments walk. Facilities: restaurant, bar, coach parking. The Redcastle Oceanfront Golf & Spa Hotel in County Donegal is a superb 4 star resort nestled on the shores of Lough Foyle in Inishowen. Located at the tip of Donegal on the Wild Atlantic Way touring route, Inishowen will simply take your breath away with its wild coastline, tiny fishing villages and natural charm. Approx 20 mins drive to Derry city & airport. Facilities include: restaurant, bar, leisure centre, coach parking. Downhill Inn Hotel in Ballina is a 3 star hotel that prides itself on both excellent service and value for money. This family owned hotel is a great base for exploring Mayo and the West of Ireland and is well regarded among guests and locals alike for its friendly staff and atmosphere. Harlequin Hotel is a 4-star hotel in the heart of Castlebar town. Its restaurant serves a mix of traditional Irish and international cuisines using local ingredients. Located in the west of Ireland just approx 10 mins drive to Westport & one hours drive to Galway. It is a great location to experience all that the west of Ireland has to offer. Facilities include: restaurant, bar, coach parking. The McWilliam Park Hotel is a 4 star hotel situated in Claremorris, Co. Mayo in the West of Ireland. It is centrally located to accommodate travel to Ballina, Westport, Castlebar, Sligo and Galway. Located just a couple of minutes walk to the centre of Claremorris town where guests can visit many local shops, restaurants & bars. Facilities include: leisure & spa, bar, restaurant & coach parking. Situated in the heart of the beautiful countryside town of Roscommon, the 4 star Abbey Hotel is a multi-award winning and charming family-run, 18th-century Castle Manor Hotel. It is owned and run by the Grealy family since 1963. It is a great base to explore Irelands Hidden Heartlands yet approximately only one hours drive to Galway & the rest of the West of Ireland. Facilities include: bar, restaurant, leisure centre, coach parking. Midlands Park Hotel is a 4 star hotel in the heart of Portlaoise town. With a well known reputation for service, it is located just one hours drive to Dublin and close to many other attractions including Kildare Outlet Village/ Wicklow mountains/ Japanese Gardens & National Stud & Kilkenny City. It is a great location as a base or as an overnight for Dublin. Facilities include: restaurant, bar, leisure centre, coach parking. Osprey Hotel & Spa Naas, Co. Kildare is only 35 minutes drive from Dublin City and close to all major routes. The Osprey complex includes a 4 star hotel, conference centre, leisure centre & Spa. Located in Naas town, guests can walk to local shops, bars & restaurants. Local attractions include: National Stud & Japanese Gardens/ Newbridge Design Centre/ Wicklow Mountains/ Avoca/ Glendalough/ Russborough House. Riverside Park Hotel and Leisure Club in Enniscorthy is a 4 star hotel, ocated on the banks of the River Slaney. With fantastic leisure facilities and a highly popular bar & restaurant this is a great hotel to stay at when visiting Wexford. It is 30 mins drive approx to Rosslare Ferry, it is close to Waterford, Kilkenny, Wicklow & approximately one & half hours drive to Dublin. Facilities include: restaurant, bar, leisure centre, coach parking. Woodford Dolmen Hotel, Kilkenny Road, Carlow. Woodford Dolmen Hotel is a charming hotel located on the River Barrow outside of Carlow town. It has 81 well appointed rooms with magnificent views and 10 acres of stunning gardens and picturesque green grounds. It is a great overnight alternative for Dublin being only approx. 40 mins drive & works as a great alternative to Kilkenny or as a base stay for a group. It is close to Kildare/ Wicklow/ Wexford/ Waterford. The County Arms Hotel is a 4 star hotel in the Georgian heritage town of Birr, which is the home of Birr Castle & the Great Telescope. The hotel has 70 Bedrooms - Restaurant & Bar - Coach Parking - Meeting Rooms – Leisure centre. Aspect Hotel Kilkenny is an excellent hotel located just outside Kilkenny city. The hotel is just off the city ring road, that leads to all major routes. Aspect Hotel Kilkenny prides itself on its high level of service in modern surroundings. It has 80 guest rooms with free internet access/ coach parking/ restaurant & bar. Local attractions: Kilkenny Castle/ Jerpoint Pottery/ Kilkenny Design/ Traditional Music & Dance/ GAA . The Viking Hotel is located just outside of Waterford City Centre. It is a great base to explore Waterford and the South-East of Ireland. It has 100 bedrooms providing all modern amenities. It also boasts a bar & restaurant/ coach parking. The hotel is close to Rosslare/ Wexford/ Kilkenny. Viking Hotel is located along Ireland’s Ancient East route. Quality Hotel Youghal is superbly located on Redbarn beach, close to the start of the Wild Atlantic Way. It just 5 mins walk to the historic town of Youghal. It is also 35 mins drive to Cork city and 1 hours drive to Waterford. The hotel has the Capel Island Restaurant & Coast Bar along with coach parking. It is a great location for a group touring south of Ireland. Vienna Woods Hotel in Cork city is a country house style 4 star hotel. The property is located in over twenty acres of woodland & is only a 7 minute drive to Cork City Centre. It offers direct access to major route ways along with Cork International Airport. Close to Fota Wildlife Park/ Cobh/ Kinsale/ Skibbereen. Close to Limerick & Kerry also. The hotel is located along the Wild Atlantic Way route. There is coach parking on site. The Leopold Hotel Sheffield is a unique 4 star hotel located in the heart of Sheffield. It is set in a historic property that was once a Boys Grammar School and has been restored in a charming fashion. The hotel has 90 rooms & is well known around Sheffield as a great place to go for a drink and meal or its highly popular Afternoon Tea. Superb dishes served in the hotels restaurant & bar. The location works as a great stop over on route to or from London to Scotland or as a base stay. Close to the Crucible Theatre/ Sheffield Arena/ Peak District National Park.